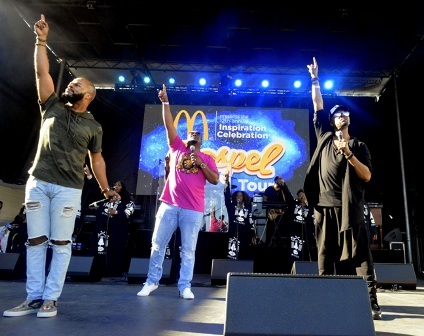 The McDonald’s Inspiration Celebration Gospel Tour made its final stop at the Taste of Soul in the presence of more than 350,000 attendees and it was nothing short of amazing! 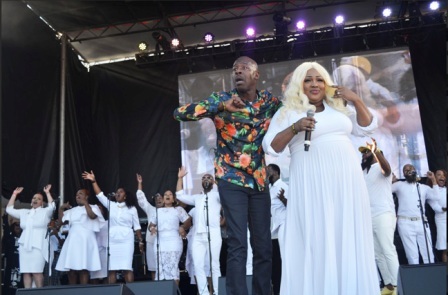 The critically acclaimed gospel stage, sponsored by McDonald’s and dedicated in the memory of the late Brenda Marsh-Mitchell, featured a number of performances from the nation’s biggest gospel music acts. Hitting the stage to bring hope, inspiration and a whole lot of joy were singers and songwriters Donald Lawrence, Deitrick Haddon, Geneen White, JJ Hairston, Todd Dulaney, Paul Porter of the Christianaires, Renee Spearman, Lonnie Hunter, April May Cooper, Brent Jones and Keith “Wonderboy” Johnson, among others. Well known choir ensembles of Southern California such as the Holman United Methodist’s Jubilant Voices, West Angeles “New Generation” Choir, the Radio Free KJLH Choir, FAME Unity Choir and the Inland Empire Choir also hit the stage. Andre Russell of KJLH’s Stellar Award-winning radio show “Spread the Word” along with Christian comedian and radio personality JRed co-hosted the Holy Ghost soiree. Mega event producers Ricardo Mowatt of Mowatt Entertainment and Pastor Kevin Sauls coordinated the logistics for the stage and say it all comes down to having “a vision to create an opportunity beyond the church walls”. The duo, who work closely with partners at McDonalds say it’s there goal to show how we as a people can “extend ourselves to compassion.” “It takes vision, it takes collaboration, it takes dedication and it takes cooperation on so many different levels,” Pastor Sauls and Mowatt said as they thanked all of the churches, choirs and pastors for their involvement. 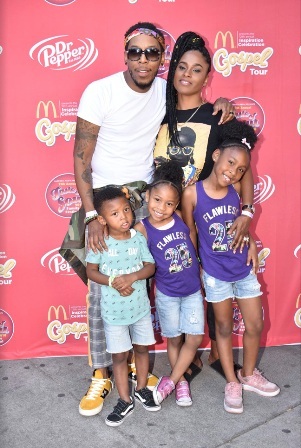 Chart-topping singer-songwriter and Pastor Deitrick Haddon said community is what he lives for and is the reason he started Hill City Church in Watts, CA. “We’re doing things every week for the community and just letting them know we’re here to show love and spread inspiration,” Haddon said. When asked about what he believes people should know in this season, Haddon says he simply charges people to “hold fast” to their faith. “A lot of people are losing faith and judging God because of things men and people have done. Don’t do that. Hang on to your relationship with God and don’t take it out on God because people done hurt your feelings,” he said. “Stay connected to God, stay connected to the church. Go back and tell God thank You and don’t let nobody sway you from your relationship with God,” Haddon continued. Artist Lillian Lloyd who gave a heartfelt performance alongside Grammy-nominated artist and Stellar Awards Hall of Famer Ricky Dillard also weighed in on the importance of reaching outside of the four walls to touch those who are broken. “Anytime we get the mic to sing the praises of the Lord, it’s never about entertainment, it’s always about giving a message of hope. Anything that we can say or do that will keep people from committing suicide, from making bad choices in life, I am definitely on board for that, that’s my mission in life,” Lloyd said. “People that are in church are there because they know they are supposed to be there, people on the outside don’t know Jesus and that’s why He said to go out to the hedges and the highways and compel them to come. That’s what real Evangelism is, this is where real ministry starts,” she continued. The Sentinel also caught up with members of the California Black McDonald’s Operators Association (BMOA) who say it is their mission “to make sure that the concerns and the things that are relevant to the Black community are relevant to McDonalds.” BMOA says that they understand “it’s not just about taking from the community but about giving back” in communities where Black people organize and do business. The association also places emphasis on youth and young adults, educating them on the value of money, work and education. To see exclusive interviews and performances from the Taste of Soul gospel stage, be sure to visit www.lasentinel.net.